Metal-on-Metal Hip Arthroplasty: Does Early Clinical Outcome Justify the Chance of an Adverse Local Tissue Reaction? Larger diameter metal-on-metal (MOM) bearing hips offer the possibility of low wear and reduced risk of dislocation. We reviewed the first 126 patients (131 hips) who had a large-head (36-mm) MOM bearing surface to report the early clinical outcome and especially to determine the occurrence of dislocation and wear-related concerns. The minimum followup was 5 years (mean, 5.6 years; range, 5–7 years). We found a 98% survivorship free of component revision. No hips had been revised for dislocation. Three hips (2%) had small femoral osteolytic lesions. Because this series of patients did not completely represent our experience with this bearing surface, we queried our database for the 828 patients (945 hips) that had the same bearing surface from April 2001 to December 2008. Three patients (0.3%) had a local reaction to the MOM bearing surface on revision-retrieved tissue. All three patients presented with elevated inflammatory indices, and a purulent-appearing joint effusion at revision. The possibility of infection and the delay in diagnosing a reaction to the MOM bearing with pathology complicated management of these three patients. We continue to use this bearing surface because the 5-year results are comparable to other bearing surfaces, however, we counsel patients that a local adverse reaction to the MOM bearing surface may be a factor contributing to reoperation. Level of Evidence: Level IV, retrospective clinical cohort. See Guidelines for Authors for a complete description of levels of evidence. The institution of the authors (Anderson Orthopaedic Research Institute) has received funding from Inova Health Services, Alexandria, VA. The authors’ institution has received funding from a cooperative agreement that was awarded and administered by the U.S. Army Medical Research & Materiel Command (USAMRMC), and the Telemedicine & Advanced Technology Research Center (TATRC), under Contract Number W81XWH-05-2-0079. 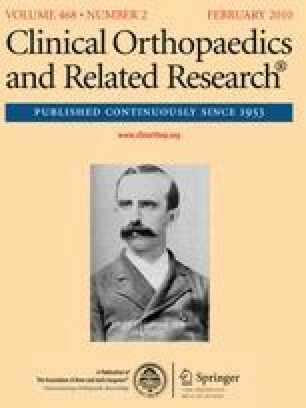 Two of the authors (CAE, CAE Jr.) are consultants of DePuy Orthopaedics, Inc. (Warsaw, IN) and receive royalty from DePuy Orthopaedics, Inc.
Each author certifies that his or her institution approved the human protocol for this investigation and that all investigations were conducted in conformity with ethical principles of research, and that informed consent for participation in the study was obtained. We thank Pat Campbell PhD,Director, Implant Retrieval Lab, Orthopaedic Hospital UCLA, Los Angeles, California for performing the tissue analysis on our cases.